Makbul Patel made 101 for Mount B. Mount maintained their 12 point lead at the top of Halifax League Division Two thanks to a 48-run victory over Leymoor last Saturday. Mount elected to bat first but their top order struggled to cope with Leymoor’s pace attack and early wickets fell. Youngster Rizwan Abed settled the side making 57 and was well supported by all rounder Ismail Patel (67) as Mount reached 250-7 in their allocated overs. Leymoor batted well in reply but they were bowled out for 202 as Mount secured a 10th win of the season to keep ahead of Luddendenfoot in the title race. M Rafiq was the pick of Mount’s bowlers as he finished with figures of 5-41. Upper Hopton are third, a further nine points behind Luddendenfoot, after they defeated Bradley & Colnebridge by 112 runs. Jordan France (54), Matt Broadbent (51no), Ian Wightman (43) and Martin Daniel (42) all chipped in as Hopton made 210-7. Bradley were bowled out for 98 in reply as Edward Kay claimed 5-51 to keep alive his side’s promotion hopes. Mount host Low Moor on Saturday before their top of the table clash away to Luddendenfoot on September 1. 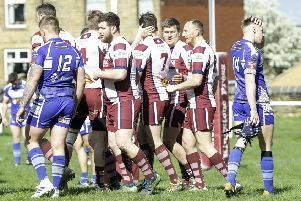 Upper Hopton will aim to maintain the pressure on Luddendenfoot when they travel to Greetland. Mount B maintained the pressure on Shelf in second teams Division One as they earned a 164-run win over Great Horton Park. Mount racked up 348 all out having elected to bat first as openers Mohammad Makda (65) and Nazir Patel (44) shared an opening wicket stand of 98 in just 13 overs. The onslaught continued as Makbul Patel struck a splendid 101 and Muzzafar Pathan made 89 as they took a liking to the Great Horton pace attack. Great Horton Park were bowled out for 182 in reply as Amjad Hussain picked up 6-51 to secure victory. Shelf now lead the table by seven points from second place Mount, who they meet on September 1 at Halifax Road with Mount travelling to Stones this Saturday.